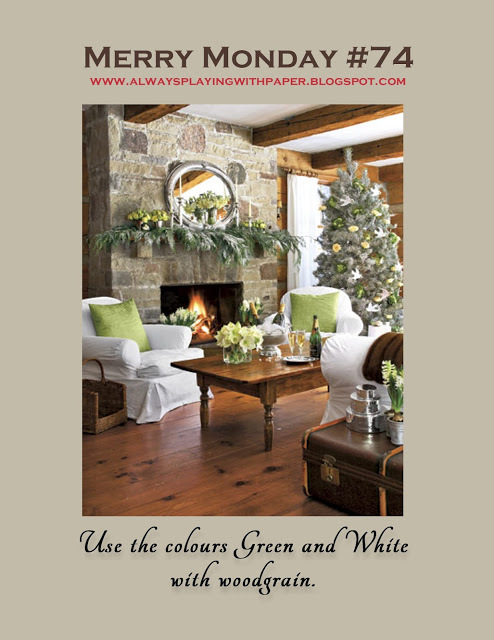 I was inspired by the country-style Christmas in the photo. 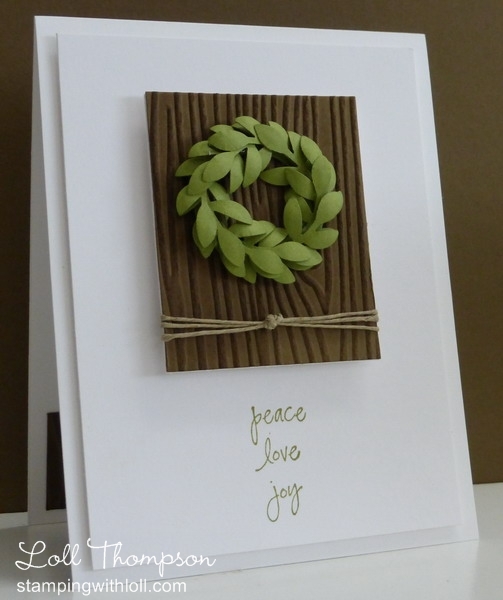 I kept my card CAS with lots of white space so your eye is drawn to the wreath and woodgrain backdrop. This wreath is made using the leafy branch from the 2-part bird punch from SU! ... it's always great to find other uses for punches and dies. I die-cut a ring of cardstock using the two smallest sizes of circle nestabilities. I punched out twelve of the leafy branches, cutting off the stems so that they were only about 1/4" or so long past the last leaf. I molded the leaves to give them shape and dimension using my stylus and mat and then glued the bottom of the stems (only) onto the ring, overlapping the leaves. The woodgrain backdrop is an embossing folder from Sizzix ... I ran it through with Soft Suede cardstock and then highlighted the embossing by sponging Soft Suede ink over top. Three strands of twine, knotted in the middle finish it off. I hope you'll join us for the latest challenge - Merry Monday #74 ... pop over to Lesley's blog to be inspired by the amazing creations from the rest of the Design Team!! Beautiful card and beautiful inspiration photo! Love your take on it. Simply perfect, Loll, couldn't think of a more LOVELY creation to come out of this inspiration photo! Another inspirational Christmas card Loll....so easy yet so effective...you little pile of Christmas cards are steadily growing aren't they? Wonderful card Loll, great concept, thanks for all the inspiration you give, I so enjoy your blog every time you post. I have not been commenting much of late, but I am here and watching. A bit under the weather as usual, but hanging in there. Fab card, Loll! I love all the dimension on the wreath. What an ingenious use of the bird/leaf punch Loll - this is a gorgeous card and the colours are lovely - very peaceful. This is so lifelike. The leaves look real. So pretty. Thank you, thank you Loll for your complete description on how to make your gorgeous wreath. It looks stunning over your soft suede woodgrain eb layer. Love your knotted twine too. I just have to CASE your card to show my girls. They will flip over your design....just like I did! What a beautiful wreath, Loll! Your shaping really makes it stand out! Love the way you did the woodgrain too! A perfect CAS card, my friend! What a stunning card. Love the woodgrqin and the jute knot textures! Your wreath is so beautifully shaped! Love the 3D nature of your card - so clever! And all that white space is so appealing! Beautiful card, Loll. My gosh girl...this is amazing! LOVE your CAS style! Loll your card is gorgeous. The wreath is so perfect, and I love the way you have knotted the twine. Wow, Loll! 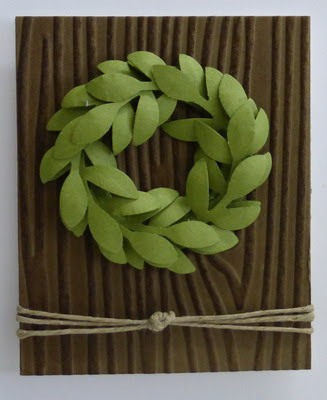 This is one stunning card, love how you created the wreath and used the woodgrain to showcase it. What a wonderful wreath you made Loll! It gives such depth to the card - the green looks great against the embossed woodgrain! A lovely holiday card! I really do like this card-love the wreath on the woodgrain background. Will use it as inspiration when I start doing my few Christmas cards. Thanks. Wow, wow this is unbelievable, love your wreath clever idea. This is beautiful Loll, Love the embossing and what a super wreath. Beautiful card Loll, I love the texture and the pretty wreath. Wow - this is WONDERFUL!! This is lovely, Loll...and now I am in trouble, I just looked up Amy R stamps....uh oh! I see an order in my future! Thanks for sharing the way you made the wreath too...it's fabulous the way it looks 3D! Lovely CAS design Loll, I adore the wreath and like how you put it together. Great card for this challenge. Sweet and clean. what a perfect clean card, i love it!! Fabulous card. Love how you did the wreath. Love the dimension and texture on your card. Loll, just love the clean lines and simplicity of this card, wonderful idea, sorry if I have commented on some of these cards before, I just always love to come here and look at your cards, even if I have already done so before!!! Nice way to start my day. I saw your card on Merry Monday. I love what you did with your leaves on the wreath to give them dimension. I'm so glad you shared the details. Your wreath is fabulous, Loll! I love it! It's so striking against the woodgrain background! Beautiful CAS card!